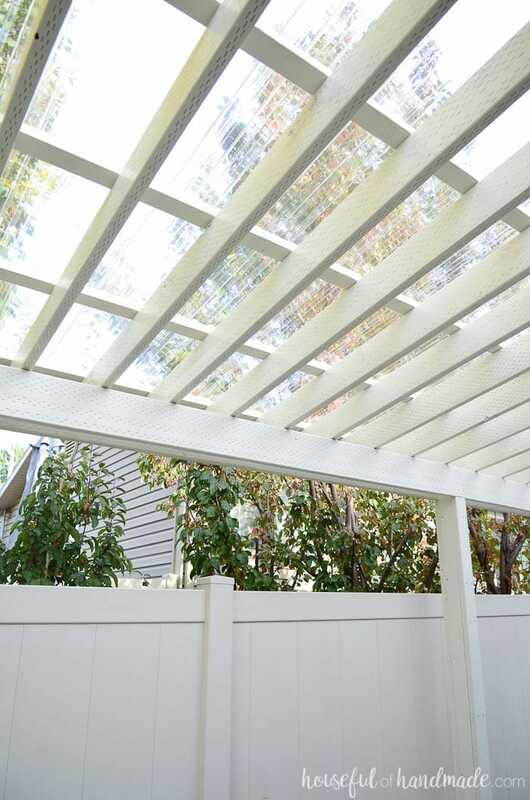 Installing a clear pergola roof was the best decision ever. It has turned our side yard is a three season patio that we can enjoy in any weather. 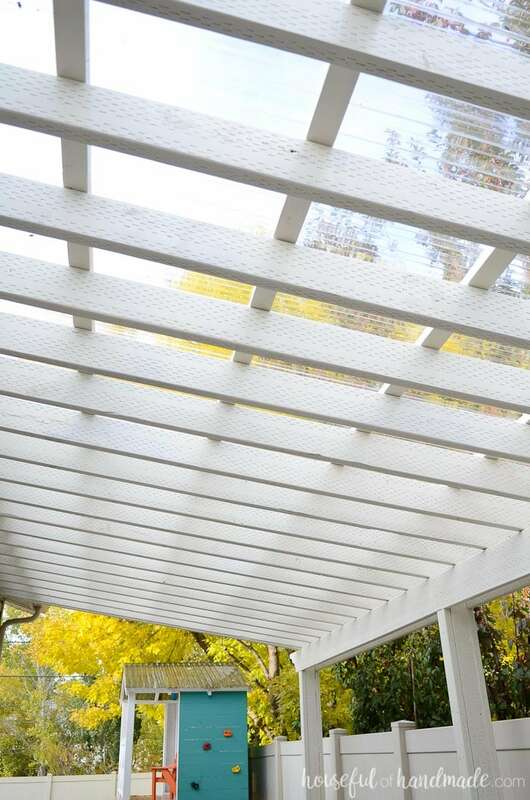 We love our new patio pergola, but the only thing that could make it better was installing a clear pergola roof. Now even if it decides to rain for an entire month (like it did in September), we can still enjoy gatherings on the patio. 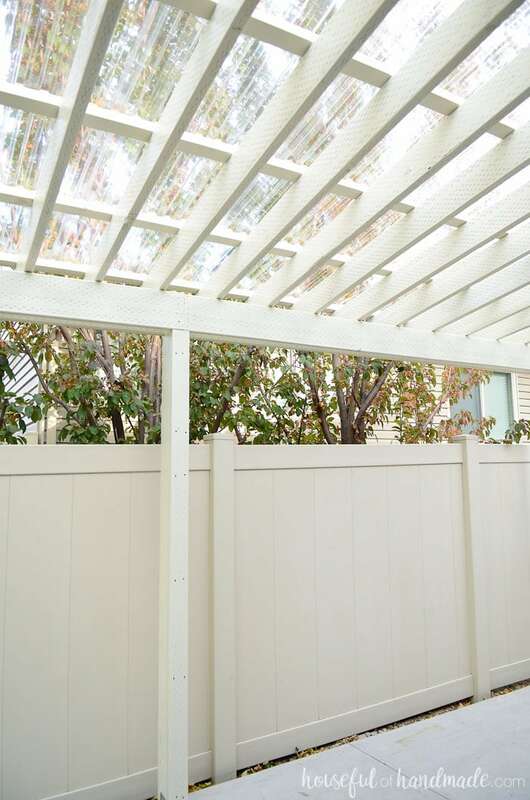 Adding a roof to a pergola seems like a big deal, but we partnered with the Home Depot to make it easy! Now we cannot wait for another storm so we can test out our new clear pergola roof. After installing the SunTuf corrugated roofing on the kids outdoor playhouse, I knew I wanted to use it again. It looks so nice and is absolutely DIY friendly. But my favorite part is that it lets the light in but blocks out the UV rays. Blocking UV rays on the patio means all our patio furniture will last longer. No more fading and sun bleaching! And we can enjoy the patio even if the weather decides to rain out another of our parties! The biggest decision we had was whether to use the same Solar Gray color on the patio as we had on the playhouse roof. I love that the playhouse has the extra shading so the kids can play in it all summer long and it stays a bit cooler. Originally I had planned on using the shading color for the patio pergola too. Then I realized the patio is completely shaded by the house in the late afternoon on and our neighbor’s trees block most of the direct sun in the morning, so we would only have direct sun for a small portion of the day. I was a little worried that the patio area might be a little dark with a shaded pergola roof, so I consulted my home design expert (aka, my mom) and she agreed with me. A clear pergola roof was the way to go! So off we went to the Home Depot for the clear SunTuf panels and I haven’t regretted my decision once! The clear pergola roof still blocks some of the sun (about 10%) so the patio still feels cooler than the non-covered area. And being able to see the sky through the roof is so beautiful. I seriously cannot wait for a rain storm so we can sit under the roof and watch the rain drops dance on it. Since it is later in the fall season now, we may have to be bundled up with a cup of hot cocoa, but you better believe we are not going to miss our first storm under the new clear pergola roof! 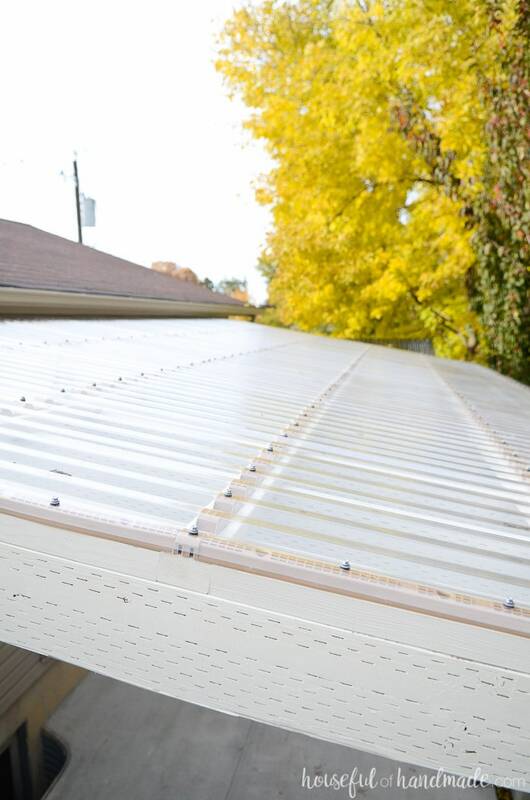 The best part of the SunTuf corrugated roofing panels is you can attach them to an existing structure. You only need to add purlins to the existing structure to attach the panels to. 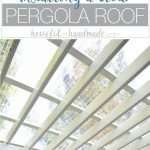 So if you have ever wanted to add a roof to an existing pergola, porch or even chicken coop, you are going to want to read on. And don’t forget to check out the complete patio pergola build and the rest of our woodworking tutorials. We used 10 12′ long panels. 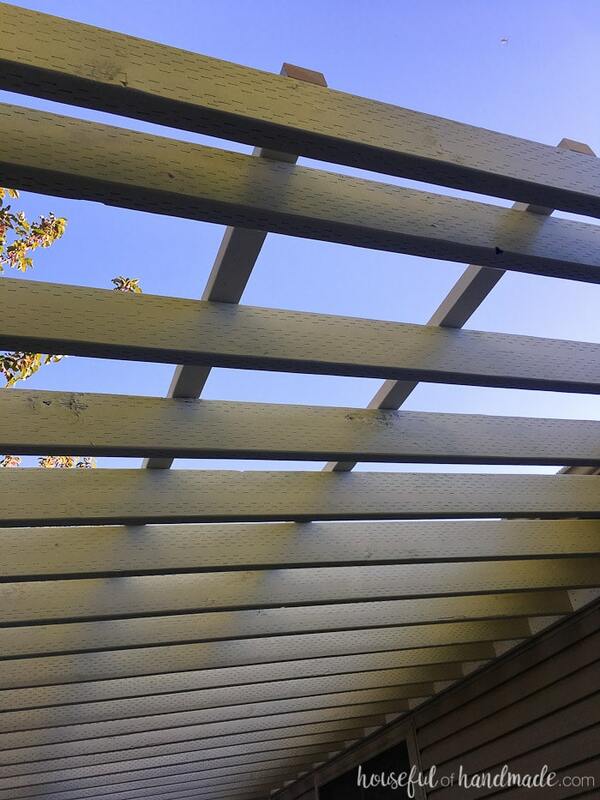 We installed the purlins to the top of the pergola from 2×3 boards. 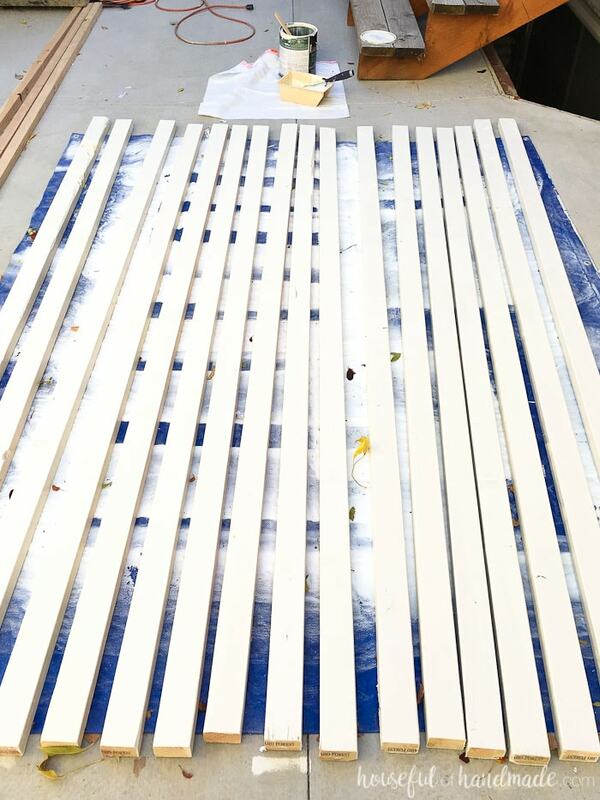 To match the pergola, I first painted the boards (way easier than painting after installing, trust me). Once dry, it was time to install. This isn’t a very hard step especially if you have two people. However, I decided to try to get it done one afternoon while my husband was at work. I think I went up and down the ladder a thousand times that afternoon (I know it was a lot because my bootie hurt so bad the next day). And I only completed 3 out of 7 purlins. The next day my husband helped me and the other 4 purlins were installed in no time. The moral of this story, get an extra set of hands to make this so much easier on yourself. 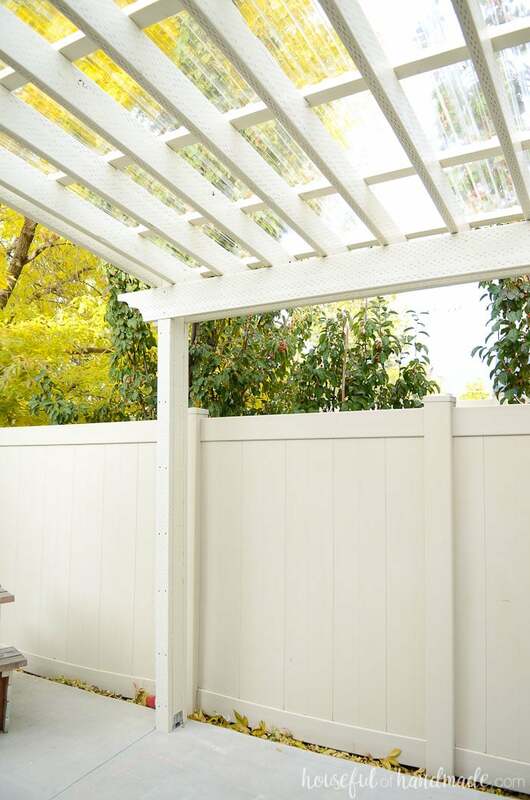 Because our pergola is large (20′ x 11′ to be exact), it took multiple boards for each purlin. To make sure they were super sturdy, we cut the 2×3 boards so they broke over a pergola cross beam. So each purlin had to be measured to make sure the cuts with the saw were braced on the center of the beams (see where the extra set of hands comes in nicely). We measured and cut the boards then started screwing them into the 2×6 cross beams so they were perpendicular to the cross beams. 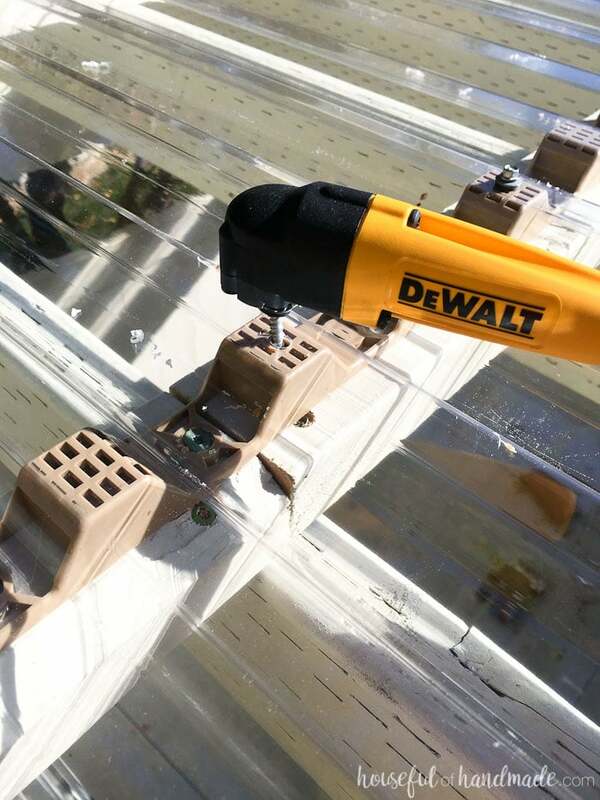 We secured them with 2 1/2″ construction screws and made sure to screw them into each beam. Our purlins were spaced 21″ on center apart. The requirement for our snow load was 24″, but 21″ made them even on the total pergola width so I figured less is better! After the purlins were attached, we needed to attach the SunTuf horizontal closure strips. 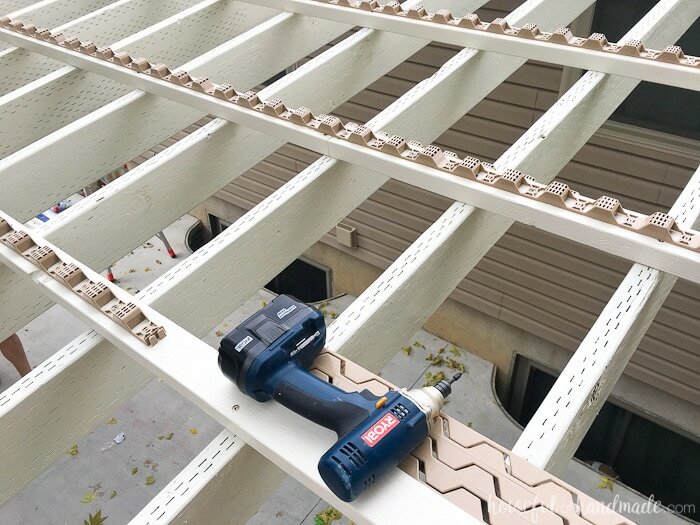 We attached them to the bottom of the purlin on the far edge of the pergola and the center of other purlins with 1 1/4″ construction screws. They are super easy to install because they just snap together at the ends. We just climbed on top of the pergola and made quick work of it. Under the eave of the house it was a very tight fit. We barely had enough space to add the pergola roof. We had to be a little creative to attach the purlins and horizontal closure strips. First we attached the horizontal closure strips to the 2×3 boards. When the board ended and we needed to attach another closure strip, we marked where the new strip would start on the next board. In order to attach the purlin on top of the header, we had to screw up from the header of the pergola into the purlin. We did this by pre-drilling a pilot hole at an angle then securing the purlin with a screw. I added a screw on each side of every cross beam. Next we attached the vertical closure strips. These go in between the ends of the horizontal closure strips just on the outer edges of the roof. We needed to add 2×2 boards in between the 2×3 purlins to bring the sides of the pergola up to the same height. These were painted before installing again. Then it was easy to cut the boards to length and secure with 2 1/2″ construction screws. The vertical closure strips were cut to fit and then attached with the 1 1/4″ screws. Now we were finally ready for the roof! All that prep took way more time that actually adding the roof, but I know proper prep is important (but I definitely prefer being able to see the instant results). We discovered that our house is not square on the property and made our pergola line up with the fence so it didn’t look crooked. So our roofing had to be measured carefully to ensure the overhang was the proper distance all the way down. So we measured the start and end of every 26″ panel and cut each one individually. It ended up being that each panel was 1/4″ longer at the back end than the front end. We put the slightly diagonal cut line against the crooked house and left the factory cut line at the overhang. To cut the panels, we clamped a level to create our cut line and used a circular saw to run right down the edge of it. It was super quick to measure and cut each one. The sound of the saw hitting each corrugation is a little scary at first, but it cuts so clean that there is no need to worry. After cutting we placed the beautiful clear roof panels on top of the pergola. They just sit onto the horizontal and vertical closure strips. Once in place, it is time to start securing it. Each screw hole needs to be predrilled with a 1/4″ drill bit first to allow for expansion and contraction due to change in temperatures. Without this there might be cracking and that is not desirable! So we used both sets of hands to make quick work of it. One person predrilled the holes and the other one came in behind with the special screws. You have to be careful when fastening the screws so they do not sink into the roofing material causing a dimple. After a few screws though, we figured out the groove and were able to quickly insert each screw perfectly. We installed screws in every other corrugation except the last one where the next panel would be overlapping it. 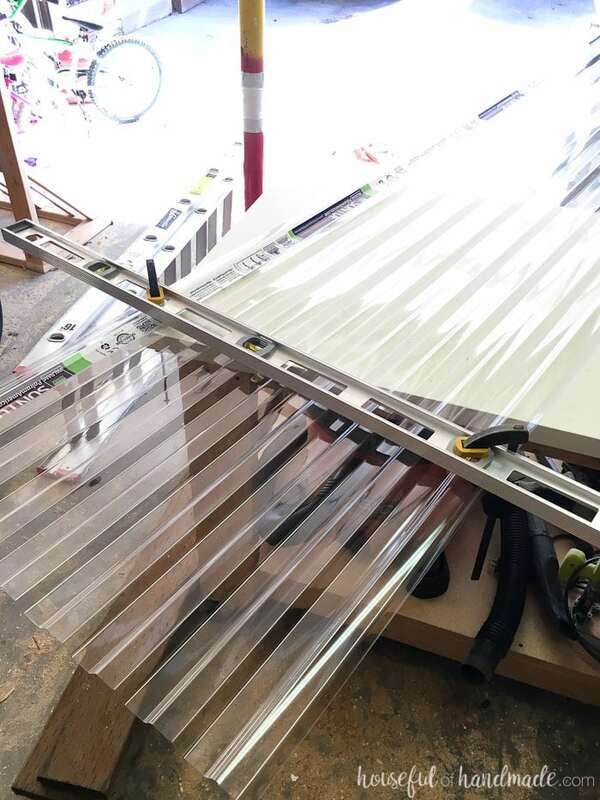 To install the next panel, we measured and cut to the correct length. Then overlapped it one corrugation with the first panel and started pre drilling and screwing in the screws. We found it was easiest to add the screws all the way down the top of the overlap first, then go back in and fill in the rest of the panel. The rest of the day was all about measuring for the next panel, cutting, then securing it to the roof. Luckily it was a beautifully sunny day, with temperatures in the low 70s. 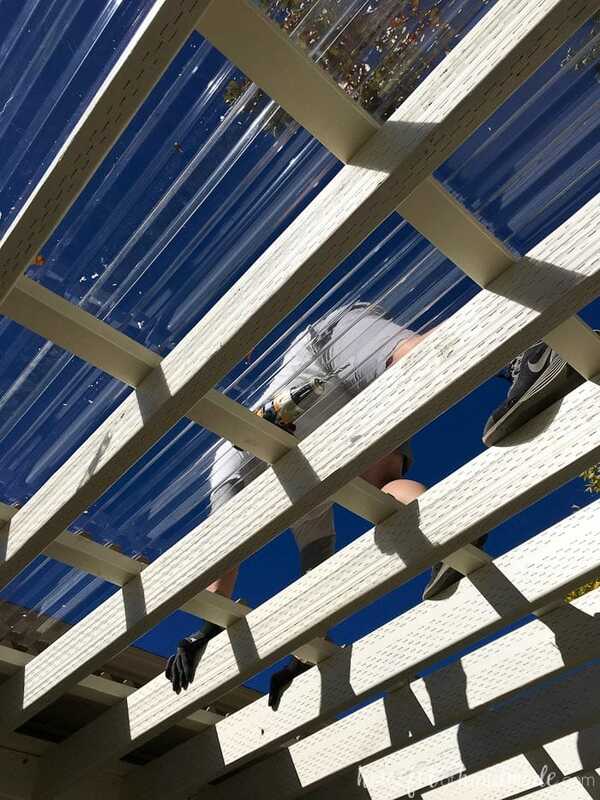 A perfect day to install a clear pergola roof! It was not hard work, but there are a LOT of screws on the top of our pergola so it did take the better part of the day to complete. But when that last screw was finally attached, we cheered a little bit and then had a few minutes to admire our work before the kids needed us. The next day I couldn’t stop myself from wandering out onto the patio every couple hours to admire the new clear pergola roof. It just looks so beautiful with the trees and sky behind it. And now we finally get to fill the patio up with furnishings so we can start to enjoy it! The plan is to create an outdoor dining and kitchen area so we can have many family dinners together. Next I will be sharing the build plans for our outdoor kitchen island. It is going to be the perfect place to store all our outdoor eating and cooking supplies. And even has a bar area for stools so the kids can sit up to it and help cook. Stay tuned for lots more patio fun! Don’t miss out on any of the fun DIY projects, click here to subscribe to the weekly newsletter today! Thank you to the Home Depot for sponsoring this post. I only recommend products that I use and love and all opinions are 100% my own. Click here to read my full disclosure policy. Why didn’t you go to the edge of the house and cover your patio door? I have a 12 x 12 deck off the patio door and I literally it. I feel like I’m on display. I am really thinking of taking off the deck and doing this setup. The total area would be 14′ deep by 40′ wide – I laid a 12′ x 28′ paver patio on the east side of the garage last summer. But is yourbpergola flat or Angled? How does the water run off n doesn’t it collect a lot of debris?? Our pergola is angled. You can see the post about how we built the pergola here. In the fall it does tend to collect leaves because the neighbors trees are hanging over it from their yard. But it runs off when it rains. We have not had any issues with it. I use the area right outside my dining room door for planting my herbs and wanted them to get the most sun they could as well as be watered when it rains. I also didn’t want to block any sun going into our sliding door since it is the only natural light we get in the dining room and kitchen. But if you want to cover the entire area, go for it! You will love it. You need to check with the snowload requirements for your county and city. They can vary so much from area to area and I am not an expert. It is best to check with local building codes for what you need for wind. We bought them at the same time as wood and so they were braced and secured on top of the longer boards. Also, we are very very closet to the Home Depot so transporting large items is easy. You could pay to have them delivered if that is best for you. Hi! We have a pegola in SW Montana that does get alot of snow and rain downpours. You mentioned about gutters and rain beads to divert the rain. What are rain beads? We are going to have to divert the rain some how so it wont run back toward our house. I have thought about gutter but would be interested in something less noticeable. Rain beads do not divert the water like a gutter, but they just channel it to the ground. I feel like it helps for the water to go into one spot and not as heavy (as to create deep trenches). We have the gutters from our house diverted underground and coming out in areas that are farther away from the house to keep the water away. Maybe something like that might be helpful. Hi! Came in via Pinterest. 🙂 I had a back porch with a corrugated roof that fell apart in a house fire. I’ve since built a pergola and this roofing was/is absolutely my plan! It’s nice to see it in action. I currently have solar fabric, but that durability is so limited. I have a raised garden bed against the outside of the pergola. My concern is the rain run-off making trenches in the garden. Although I’m thinking northern Utah might not have the same rainfall as the DC area, I was wondering if you have since thought gutters along that edge might be wise? I do love the clear, BTW. No distracting color that might not compliment your house. Yes you definitely get a trench from rainfall. We have our roof drain into a space between the fence and the cement patio so we do not notice it. I know you can add things like rain beads or even a gutter to help control the rainfall. Hope this helps! I absolutely love our patio and cannot wait for it to warm up a little so we can use it again!!! Hello. Thanks for the info. How high is it from the bottom and is there flexibility to make it taller (ie 10 feet or more ) ? Also does it attach to the existing roof ? I’m sure you can make it taller. Just make sure the structure is solid and the slope is there. It does not attach to our existing roof, it tucks up under it (about 6 inch between it and the eaves). Love your idea. I live in New England where we do get large amounts of snow. Do you think this material can withstand Mountain winters? You will need to check with your own building codes for snow load requirements. The actual roofing isn’t the problem, you need to make sure your pergola can hold the weight of the snow in your area. Hope this helps! 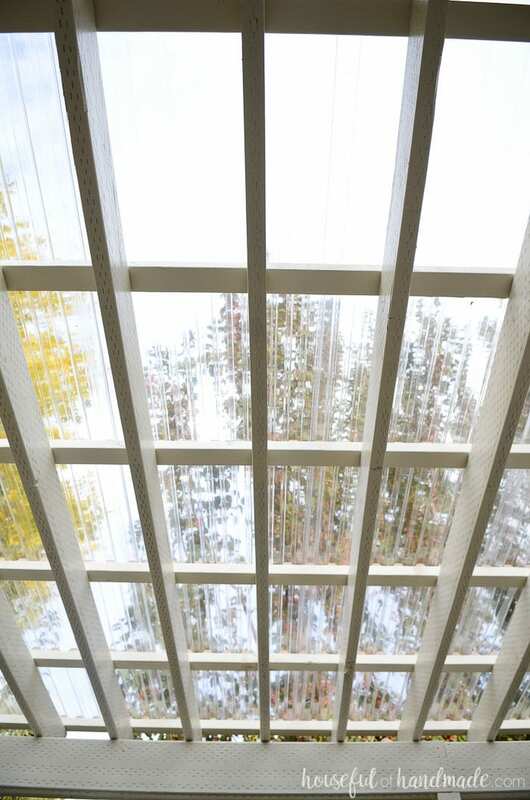 We have a deck off of our second floor and would like to add something like this UNDER the deck so that our patio below stays clear of snow and rain. Do you think we could use this product under the deck….making sure to install using the recommended pitch? I would check with the manufacturer to make sure the product will work that way. I used it according to their recommendations! 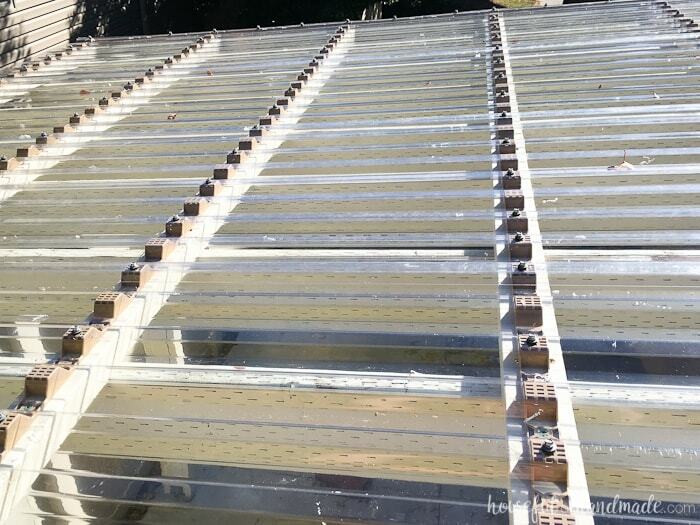 I had a clear roof panels on my greenhouse but the first time we had hail we sustained quit a bit of damage, So who is the panel maker you used please and where did you get them? I used Suntuf brand from the Home Depot. We have had an intense hail storm and while it sounded like we were under attack, the roof still looks great. I am going to be posting pictures of it in the coming spring (after our second winter). Hi Kati. Very nice project. Looks great. Could you please tell me the distance (center to center) between the 2×6 cross beams. Thank you. We did 12″ in between each beam. Looks great! Did you paint all the wood before you put it up? Hi It looks great. Could you please tell me the headroom height you have under the 2×6 beam on the outside? I am planning a 10′ x 20′ patio cover using Suntuf, and like you planning on installing under house eave, but will not have 1 1/2″ per foot fall. Thanks! The bottom of the header on the house is 9 1/2′ above the ground. Since our patio is only 11′ wide, we only needed it to fall to 8′ on the other side for the 1 1/2″ fall. Did you add some down slope to help with water run off? I plan to hang orchids and tropicals under the pergola and since I had to cut the large white oak that used to provide shade for plants and people I now have no shad from the west sun. I think I will need to use the smokey. Question is how much shade from the sun will that provide? Enough for orchids? Yes there is a slope to the roof. I do not grow orchids (or any delicate plants for that matter because I am more of a plant killer) so not sure what kind of requirements they need, but the solar gray on the kids playhouse makes it feel like it is shaded like a tree. Its about 70% of the light coming through. Hope this helps! Most are Phalenopsis and this great for them.. the others like sun like the succulents do. How did you manage the seam where it connects to your house? Is there some sort of hardware that you use to seal the gap? 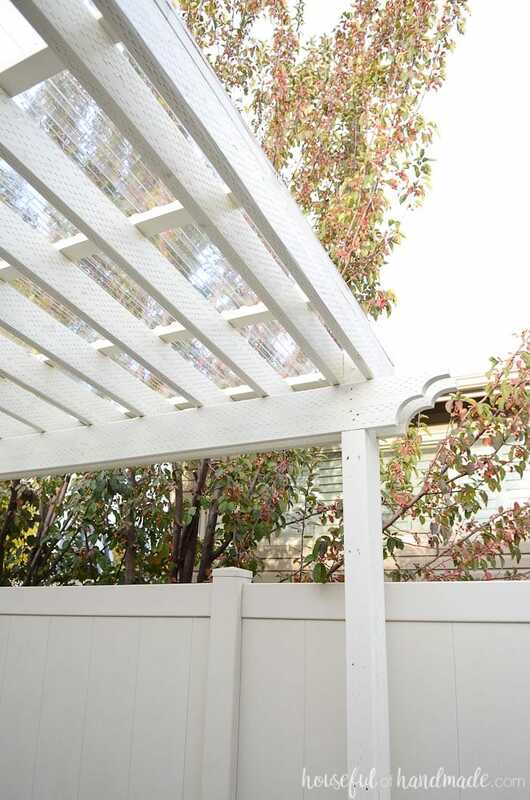 Because our pergola goes right under our roof overhang, we did not worry about the seam. 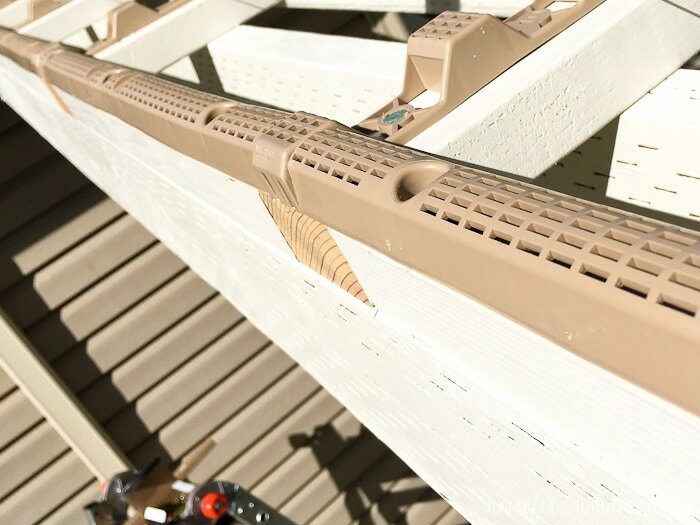 But SunTuf makes specific pieces to go under siding or with other house materials that will seal it next to the house so you don’t have water coming down there. 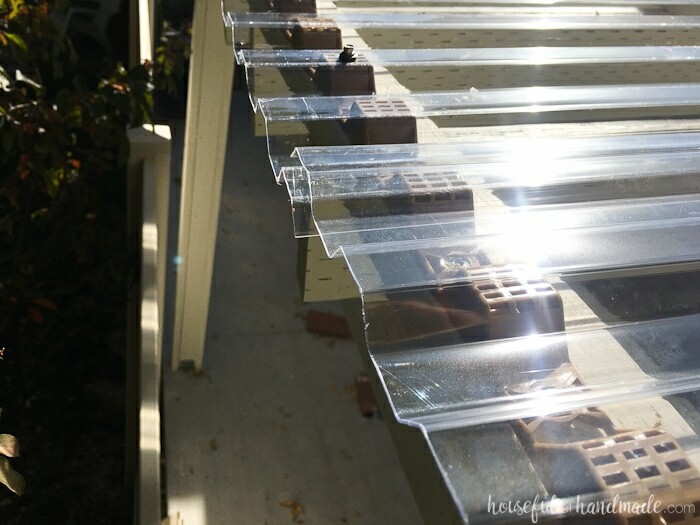 You can check them out here: https://www.homedepot.com/b/Building-Materials-Roofing-Gutters-Roofing-Roof-Panels/N-5yc1vZaq4r/Ntk-Extended/Ntt-suntuf?Ntx=mode+matchpartialmax&NCNI-5. Thanks for the link. I was wondering if they had seam type material. Our pergola attaches and partially goes around, and outdoor brick fireplace. It’s very thick, so I’m not worried about the heat. But I’ve been trying to figure out how to keep it from leaking where the two meet. I’ll check out the link. And thank you for a clear tutorial. 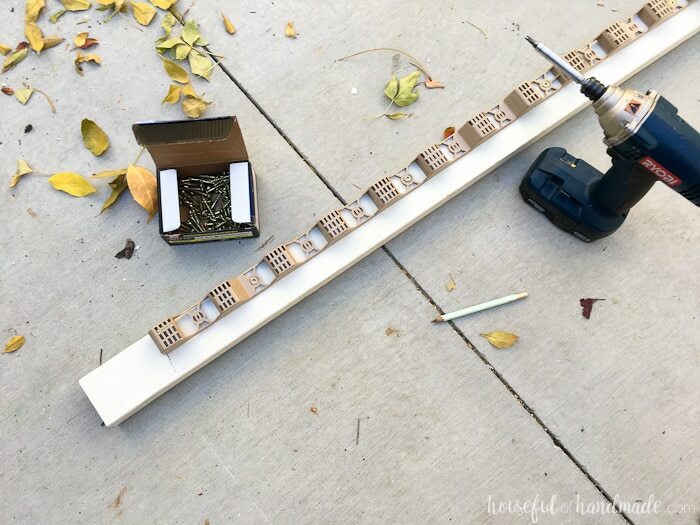 I just stumbled upon your blog and this project and love it! I do have a question. You mentioned in one reply to a comment about how you kept your natural light that went into the house. Do you find that the panels are clear enough to see through? We were going to build a retractable roof so we could see the stars at night, but a clear roof would give us the benefit of coverage AND seeing through it. IF, of course when you look through the paneling it doesn’t make everything look fuzzy. Thanks CJ! The panels are super clear and I can see right through them. There is very little fuzzying. Since we live in the city, we rarely see any stars though, so I do not know if you would still be able to see them through it. I was not sure how much relief from the heat the clear would give us, but this last couple of weeks we had temps near 90 and lots of sun. I was working on a project next to the pergola and then walked under the pergola to grab something and was shocked by how much cooler it was. With the shade from the actual pergola and the clear roof, it was about 10 degrees cooler under it. I swiftly moved my project under there to finish 😉 I really love the amount of light that comes through the clear because I have 2 windows under the pergola. I would do clear again in a heartbeat! Hi Kati! I am so in love with the project! You guys did a fantastic job! 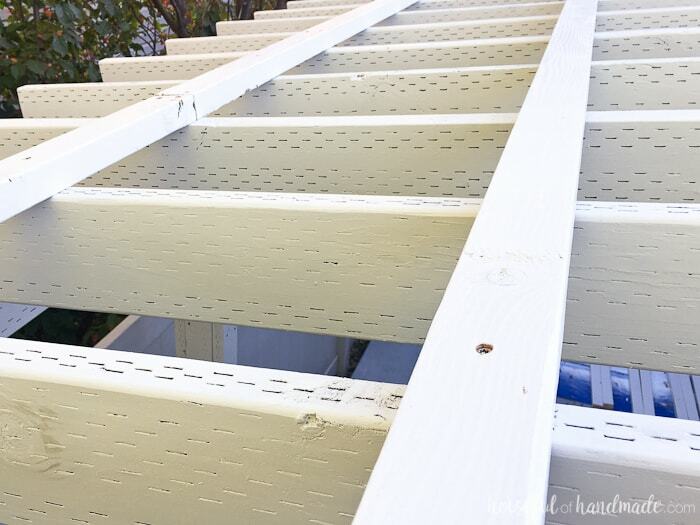 We just tore down a very old and weathered pergola over our patio a couple weeks ago and we’re planning to rebuild it with a roof similar to yours (although I’m struggling like you….to get clear or gray panels??). I was wondering if you’ve experienced any condensation/drips from underneath the panels, especially in the morning? Some of the reviews on Home Depot’s site mentioned that….and that would be a bummer if so. For me the clear roof won out since the pergola covers 2 windows of our house (one that is my office) and I wanted to keep all my natural light coming in. But the kids playhouse has the gray and it’s also great! Sorry I am no help. It is super dry here in Utah so we have very little condensation anywhere. I have noticed 2 drips with the last rain storm and will watch those to see if I need to fix the screws up-top to get a better seal (since the screws are what seals the roof). But we love our roof and it has been totally worth it. Do you find that in the summer the summer the pergola acts as a greenhouse? I love the idea but I’m concerned about ensuring area providing shade during summer. Hi Bruce, we have not noticed any heating up, but have not had it up in the heat of the summer yet (built it just last fall). The two open ends are in the wind path too so we get a nice breeze through it most times. I’ll have more information after this summer! I’m impressed. That you are in Northern Utah and it works for you means it would work for me as that’s where I am. Looks amazing! I have been considering doing this for some time but have been hesitant. Your post gives me the confidence I might be able to pull it off. 😉 Curious though, as it’s not entirely obvious in the pictures, did your pergola already have a pitch to it or was it completely level on the top? Just wondering what is the minimum pitch I could get away with to allow the rain to run off. We actually built the pergola just the week before putting the roof on (you can find that post here). So yes the pergola already had the pitch we needed for the snow load in our area. The minimum specs for the SunTuf roofing is to have a 1 1/2″ rise per foot, but always good to check your own building codes. How does it look after the leaves lay on it. Can they be easily removed. Do they stain? I have not had any staining from the leaves. It is very easy to clean off, just spray it off with the hose. If we have very light rain it will leave water spots, but after a normal rain storm it looks so clean and clear! Our 20×11′ pergola roof cost us about $600. That includes the closure strips, corrugated roofing, and purlins all those screws! You can buy the roofing at different lengths but they are all 26″ inches wide which gives you 24″ of coverage when you overlap them. Check at the Home Depot website for cost for the length you will need for your roof. The screws and closure strips are pretty inexpensive, but for our roof came up to about $150 if I’m remembering right. Hope this helps! We totally love our roof and it still looks amazing even after a crazy winter! Thanks so much Kati, Spring is finally here . And I am looking forward to getting this project underway . Mine is only 10 ft wide by 12 feet long , I actually found some that is 50 inches wide and comes in 10 and 12 foot lengths . I am hoping to have around $450 into it . Your photos , project detail , and tutorials are fantastic. Good luck with your project! It will be super awesome when you are done. Lizz, we live in northern Utah and get a significant amount of snow most winters. This year we have only had one storm (it’s been an odd year) and those 8 inches were on the roof for a couple weeks before it warmed up enough for it to slide off. The most important thing to worry about for snow is the pitch of your roof. The higher the pitch the easier it will be for snow to slide off. How were you able to get all the screws on without walking all over the plastic sheets? I imagine that you need to screw in panels that are overlapping, but how did you manage to screw those? Great question! Each of the panels is only 24″ wide so we were able to reach over from the edge to secure the overlapping edge. It only has to overlap one corrugation so only 1 screw. Also, my husband climbed onto the roof to secure the higher up sections that were harder to reach since our ladder was not super tall. And I did all the lower sections just from a ladder. I am only 5’6″ and was able to reach just fine (but it did give me a good workout to secure the entire roof). Hi I’m in Florida with an extremely hot back yard, No shade at all. Does the gray tinted block out heat more than the clear? Would this be a good choice for a cooler patio? Thanks in advance. I absolutely love your work ???? The gray tinted does block out sun so therefore it will help with heat. It reminds me of being under a shade tree. I hope this helps. Hello Lauren, since we have only had the panels for 6 months, I don’t have too much information to share. The panels do get dirty, especially when you have small rain storms that just leave dusty rain spots on everything. They can easily be cleaned by rinsing with a hose though. The website says limited lifetime warranty of 10 years. The reviews were great and I am sure happy so far. I will have to share how they are holding up in a few years, but that doesn’t help you too much. This is very clever, “KUDOS”. I wish I could do this!! Too much work. Thanks Lollie. It was a lot of work, but totally worth it!